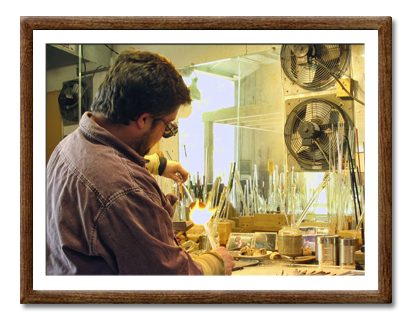 The style of glassblowing used to make Eye And I Glass jewelry is called “lampworking” or “flameworking” because the glass starts at room temperature and is heated into its working state using the flame of a specialized torch. The process of making the glass jewelry components starts with a large, thick piece of round glass tubing and many tiny pieces of crushed colored glass called “frit.” The colored glass frit is melted into the tubing, coating the glass with a vibrant pattern of color on one side and leaving a clear layer on the other. After the colors have been fused to the clear tubing, the piece is set to cool. When it has cooled, I use a variety of cutting tools to break the glass apart into pendant sized pieces and matching sized “chips” for earring sets. After the shapes for the jewelry pieces have been chosen, I then go back to the torch to smooth out all the rough and sharp edges on every piece, a process called “flame polishing.” The finished pieces go from the torch into a hot kiln and are brought up to the proper annealing temperature to ensure strength and durability. When the glass chips come out of the kiln, each piece is hand drilled in the proper display orientation. Now the glass piece is ready to be “set” into a jewelry finding. I assemble all of the jewelry myself. All of the jewelry findings, except for brooch pins and barrettes, are sterling silver. The jewelry comes displayed on a 100% post consumer content recycled card featuring the company name and a Handmade in Vermont logo. Each piece of Eye and I Glass jewelry is a unique hand made creation. The glass design incorporates myriad multi-colored patterns, which provide a mosaic/stained glass look with infinite variations. In addition to the beautifully individual color patterns, the handcrafting process gives each piece a unique free-form shape. The use of many different color schemes, shapes and sizes of glass pieces in the jewelry allows the wearer to complement their own sense of style with a piece of wearable art.